It was only a matter of time before a new craze hit the world and here it is. So move over cupcakes, do one whoopie pies, see ya later macaroons. There’s a new kid in town causing quite a stir. Introducing…………The Cronut! Well technically it’s not in town yet but the buzz it’s causing in New York is causing ripples world wide. So what on earth is it? Well If a doughnut and a croissant had little deep-fried pastry babies this is what it would look like! The man responsible for this heart attack in a bun is French chef Dominique Ansel and the queues are already going around the block of his store in NYC. Celebrities like Emma Roberts (actress and niece of Julia Roberts) have even hit the headlines for trying to jump the line only to be told the Cronut does not bow to celebrity, get to the back. So how on earth was I ever going to get my sticky hands on one?! Considering I live on the south coast of England and it’s taken nearly 10 years for the cupcake craze to actually take hold down here (seriously we’ve had at least three shops open in the last year or so) I figured I needed to try to make my own. So I did a little googling and found a recipe of the nearest thing to it, thanks to Xanthe Clay of the Telegraph. It sounded a bit complicated and I had images of fat fires in my mind but I figured I would give it a go, here’s what happened. Luckily for me I had help on hand as my friend and fellow blogger Leanne Moss (Miss Moss) was staying with me for the weekend and was my trusty photographer for the day. I started off with getting ingredients together and flavouring the sugar with my new favourite ingredient Rose Water, it smells heavenly and I found it easily at Sainsbury’s. Next was the preparing of the ready to roll croissant dough, I used ‘Jus Rol’. This needed to be folded, mended, rolled and re folded. In Xanthe’s recipe it says I would manage to get six out of the rolled out dough but there was no way I could make that happen as the dough wouldn’t stretch that far so I settled for three. I also decided to change things up with the shape and see how flowers and hearts would turn out. I had hoped I would use the leftover dough to make one more but by this time the dough had had enough of being messed with and wouldn’t play along, so I just cut a few extra mini shapes out of it to use to test the oil later. The shapes then went into the freezer for a half hour chillfest. So now it was time for the creme patissiere (creamy custard between you and me). I have never made this before so I wasn’t sure how it would turn out. Thankfully even I managed it! This went into the fridge to chill. Now this was the scary bit. Deep frying the dough. I have never deep-fried anything at home so I don’t have a special pan or a chip basket, so I had to wing it. I used the main part of my steamer for a pot as it’s nice and deep and used a potato masher to lift out the cooked dough. Xanthe’s directions recommended a thermometer for the oil but I don’t have one so this really was going to be trial and error. As I said before I had visions of fat fires and fire brigades being called so I took the precaution of having a damp tea towel ready to throw over and suffocate any potential flames! Thankfully I didn’t need it. It turns out however that the thermometer really is important. The first little dough middles I threw in burnt in seconds so the oil was clearly too hot. I took it off the heat and let it cool down and tried one of the bigger shapes. This still cooked too quickly so was dark on the outside, didn’t really rise and was pretty doughy inside. I left the oil to cool again and tried a few more ‘dough middles’ and when I felt satisfied with the heat I put in the next shape. This time all looked good! 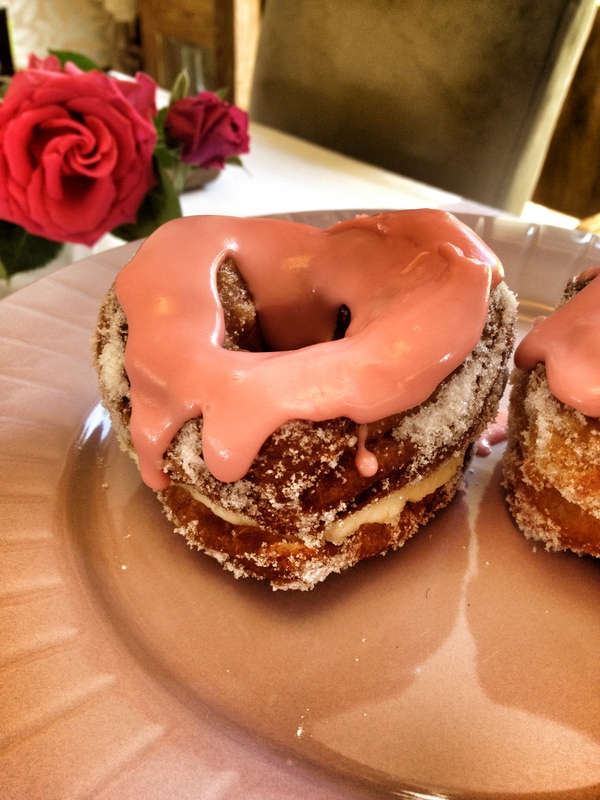 Next up it was time to roll each of my two cronuts in the now wonderfully flavoured rose-water sugar. 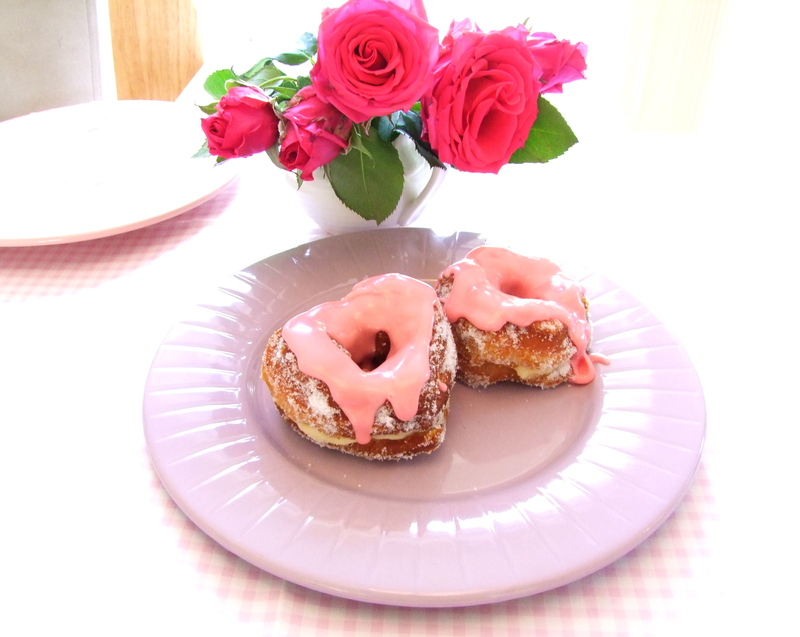 I then took a bowl and mixed icing sugar, lemon juice and a tiny drop of red food colouring and drizzled the mix over each cronut and voila! So here they are, the end result. Two rather fantastic, if I do say so myself, cronuts! What do you think? So there you have it, a whole lot of effort for only two cronuts but I had a lot of fun making them with my trusty assistant Leanne. Would I make them again? Perhaps, but I first need to run about 150 miles to work off the one I ate. Go on give them a go, try Xanthe’s recipe yourself and perhaps add your own tweaks. Try jam instead of custard or flavour the sugar with lavender. As her article says there is a place called the Duck and Waffle in London doing their own version (called a Dosant because Ansle has trademarked Cronut!) but if you can’t get to them then you don’t have much choice but to make them at home. Or else jump on a plane to NYC and get in the queue, you might even be standing in front of a film star.